Thanksgiving morning was quite frosty. The temperature was just at freezing and there was no wind, so it didn't feel particularly cold. Of course, I was bundled up for the walk. Frost covered much of the ground and the leaves of the low shrubs. Very nice. The frosted leaves of blackberry vines. We had a very pleasant and hassle-free shopping trip on Friday morning. Our first stop was Ikea in Tours, about an hour from home. The store was not yet crowded when we got there. The sales people to whom we asked questions were very friendly and helpful, except for one small detail: they didn't know what they were talking about. Both of them were wrong either about where to find an item or whether they had it in stock. But they were wrong with a smile. Oh well. We got what we went for, and then some. In and out relatively quickly and no waiting at the self-checkout. Next we drove up to the North Tours shopping district to the Asian grocery we know there and stocked up on some staples for cooking Asian food. Again, a relatively easy trip, no hassles, and we were home in time for lunch. After lunch, I built a fire and spent the afternoon assembling Ikea stuff. Thanksgiving has come and gone. Again. We had a nice quiet day at home, which made it really no different from most every other day. The lamb was delicious as were all the fixin's. As an apéritif, we drank a local demi-sec bubbly. The wine with the meal was a Beaujolais-Villages Nouveau. 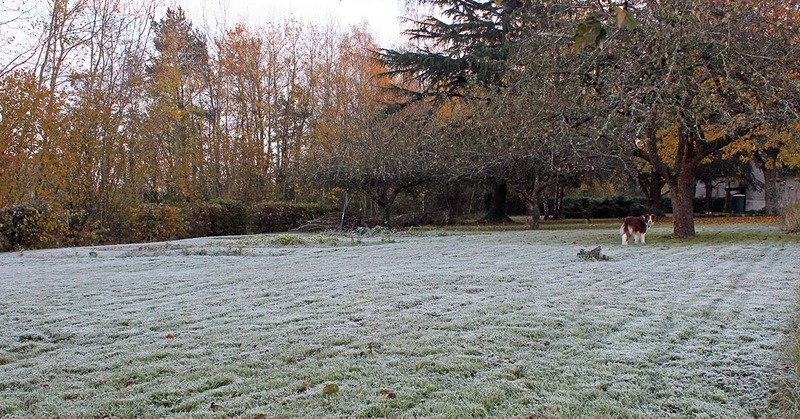 The temperature was 0ºC (32ºF) and the grass was frosty. So were Callie's toes, but she didn't mind. This year's Beaujolais Nouveau doesn't taste like a "new" wine to me. If I didn't know, I wouldn't be able to tell the difference between it and a one- or two-year old bottle. 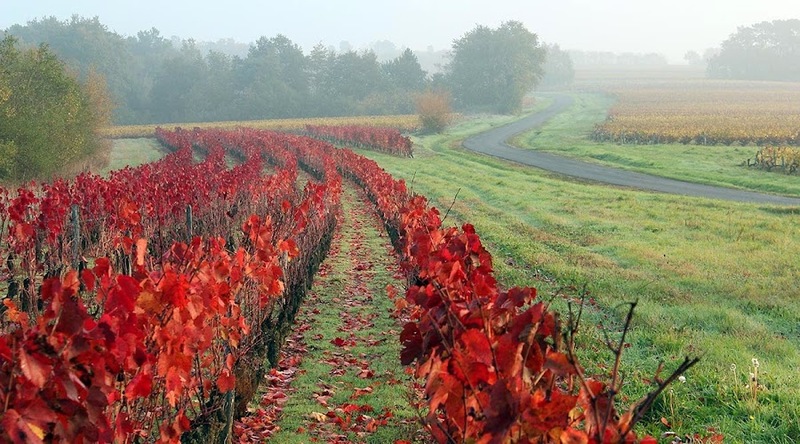 And since the grape in Beaujolais is gamay, the principle grape in our own region of the Touraine, it's almost like drinking a local wine. If you celebrated Thanksgiving, I hope you had a nice one. On to the solstice! This morning the temperature has gotten down to freezing. It was predicted, so it's not a surprise. The leaves on the grape vines are turning brown and falling off. Some of the growers out back have already started their winter pruning. The trees are shedding their leaves as well. This line of trees between two vineyard parcels marks a stream bed making its way down toward the river. The leaves are nearly gone. Ken and I are preparing our traditional non-traditional Thanksgiving meal: roast leg of lamb with green beans. I don't know when we started doing lamb for turkey day, but it's been decades. It's a good thing to do in France as whole turkeys are not easy to come by this time of year. You can always find one for Christmas and New Year's, but Thanksgiving (which is not a French holiday) is too early. Yesterday was a nice day with sun and temperatures around 8ºC (high 40sF). I got the grass cut, finally, for the last time this year. I also got a shrub trimmed and we brought the last of the potted plants inside for the winter. 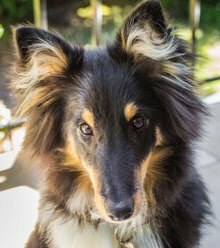 There are still some more yard chores to do, but they're not urgent and can be tackled whenever the weather cooperates. 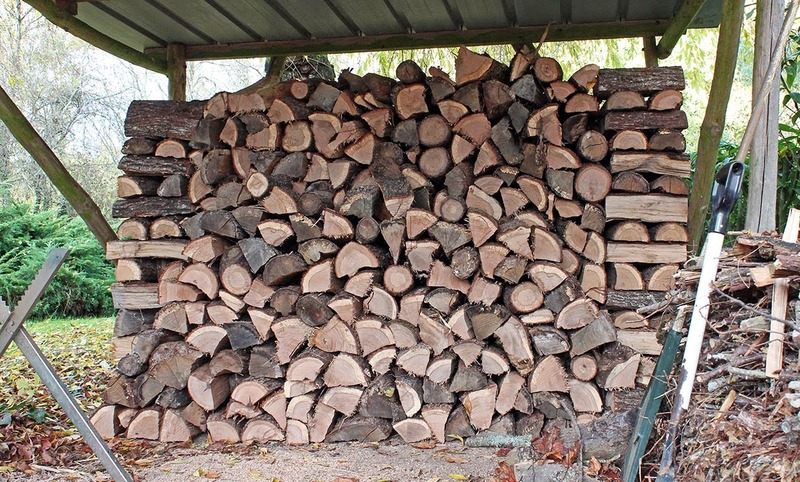 Finally, I finished sawing the oak logs that we'll burn over winter. I normally do it in August and September, but we didn't get the wood delivered until the end of September this year. Then it took me two months to cut, mostly because I got sick for a while and then the chainsaw got sick for a while, and we also had some wet weather. But now it's done. Phew! The log pile. It's three and a half rows deep. And I've been burning for a month now, so it would easily be four rows deep. You want numbers? I got numbers. We bought 5 stères (5 cubic meters, or 1.4 cords). 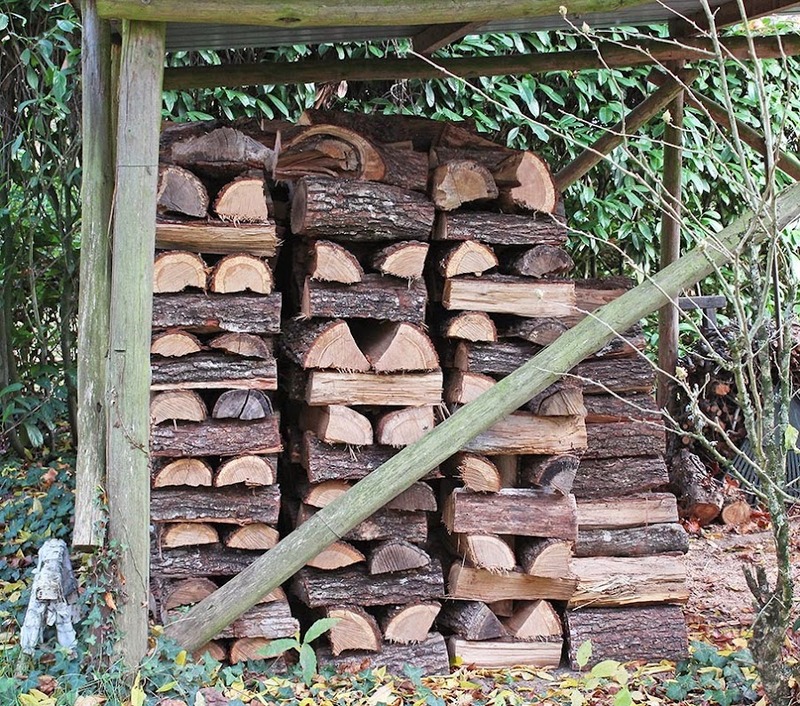 Each log is one meter long (about 3 feet), which is the standard size for firewood in France. I cut 320 logs. Two cuts per log equals 640 cuts with the chainsaw. That gives us three burnable segments per log, or 960 pieces of wood to burn. Many of those get split by my axe during the burning season. Just call me Gimli. A view edge-on. You can see the three rows, plus part of the fourth. I'm hopeful that it's enough for the winter. I didn't cut near this many last year and we ran out of wood toward the end of the season. We should have enough this time, unless it gets very, very cold. I went to the supermarket on Monday to get some of our Thanksgiving food and a bunch of other stuff that we needed. Namely: pet food. It's a rare occurrence, but it happens. I needed dog kibble, cat kibble, and dog treats all at the same time. My cart was full after I went through the pet aisle. Twenty kilos of dog kibble (big bag, 40 lbs. ), and two other smaller bags. 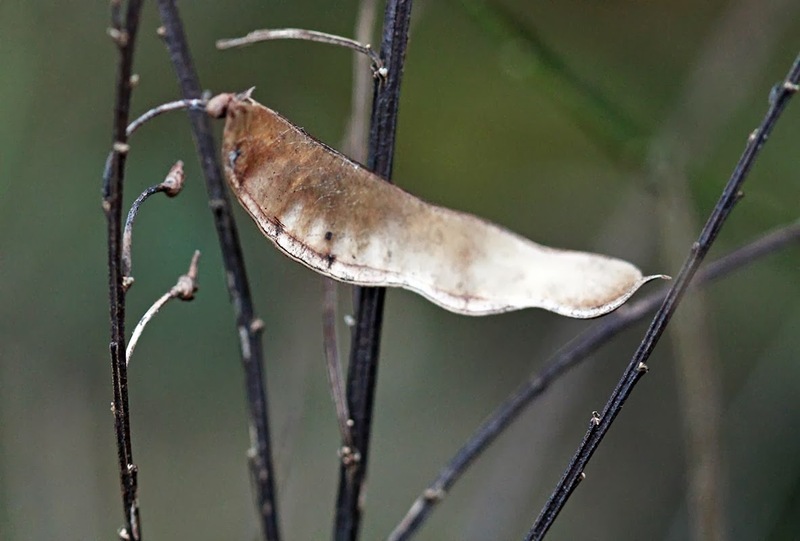 A broom seed pod. I didn't get the focus quite right. Depth-of-field at f2.8 in low light and a breeze is very tricky. I like how the stems came out. Then I got a six-pack of bubbly water, a few bottles of fruit juice, a bottle of Beaujolais Nouveau ('tis the season), and a bottle of Port (I'm running out). Then there was produce, cheese, eggs, tortillas, and some fire starters. My cart runneth over. Ken will head out on Wednesday and pick up the lamb roast we ordered for the main event. Thankfully, the store was not filled with crazed shoppers. Just me. Except for some splashes of brilliant red here and there, the fall color in our region is mostly golden-yellow. This is a common sight around us right now. This photo is a few days old and many more leaves have fallen to the ground since I took it, many more trees are close to bare. There's still a lot of green out there. The grass will stay green all winter and so will the conifers. I'm hopeful that the rain will stay away for a few more days. I'd still like to get the grass cut one more time. Not only will the mower mulch the leaves that have already fallen, but the shorter grass will make getting the rest of the leaves up much easier. I also have about thirty logs left to saw. That should take one more session with the chainsaw, then I'll be done for the season. It's never been finished. I don't know when it was started, but it was already standing ten years ago. The house is in a small patch of woods out among the vineyard parcels. 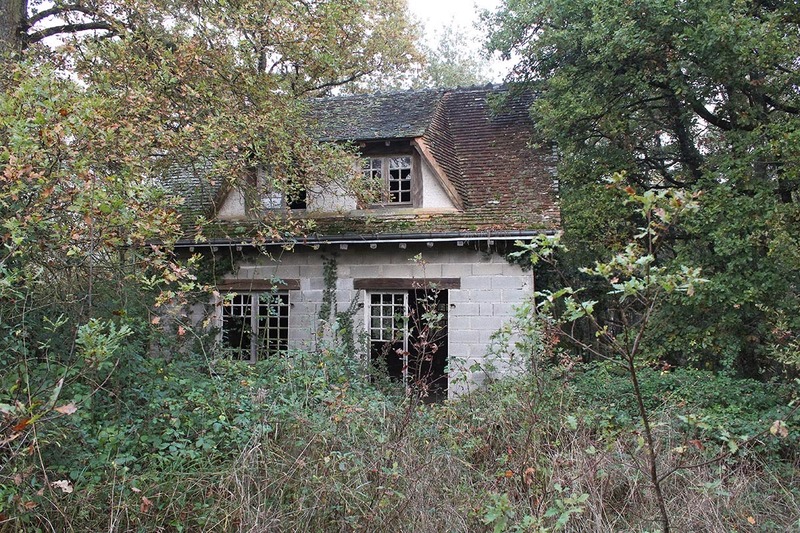 I'm sure it's never been occupied as the interior is completely unfinished, except for a fireplace. There's no plumbing apparent, no fixtures, not even a stair to the upper level. Our local abandoned house. The roof's in good shape seeing as the inside is bone dry. Where the house sits there are no nearby power or telephone lines, no water service, and certainly no sewer. It's strictly agricultural and woodland. It could be that the project was abandoned because of all that, but who knows? One of the front door panels is missing, so I looked inside. It's a very small house, essentially just one room on the ground level. The plan may have been to divide that room into a living, kitchen, and bath arrangement, and build a bedroom or two upstairs, but it would have been quite cramped. I wonder whom it belongs to? 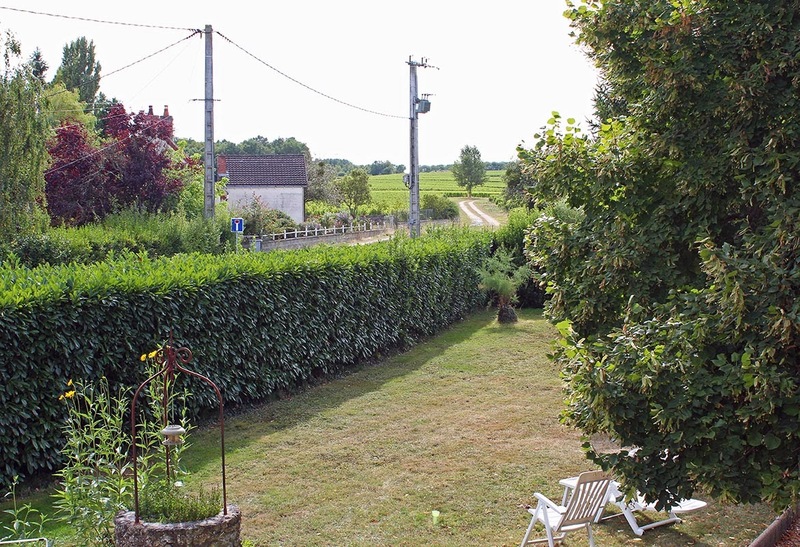 Another view of the countryside out behind our hamlet. We're on the "heights" above the river valley where streams begin their downward flow toward the Cher. These well-drained slopes are where the wine grapes are planted. A little farther to the south the vines give way to fields of wheat, colza, sunflowers, and other crops. 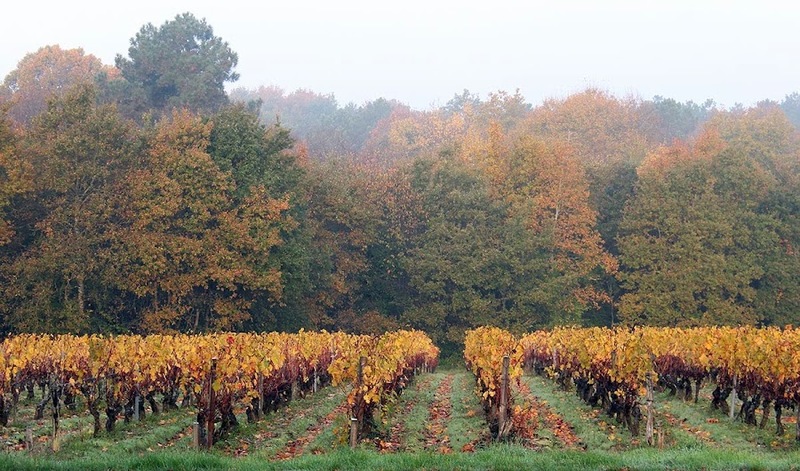 A foggy autumn morning in the Cher Valley vineyards. There is some livestock around, but not much. Very close to this spot is a farm that raises goats for cheese. A little farther on we know of a small farm with cows. Here and there we see a field of grazing sheep. All are a bit too far to get to on foot, especially with the dog tagging along (fast cars on little roads make me nervous about taking her farther), so we settle for a glimpse or two of the donkeys that one of our neighbors keeps. They're still hanging on out there. Most have withered into raisins and beyond, but some of the grapes that didn't get harvested are still looking pretty good. Freezing weather will do them in, I'm sure. I wonder if these are pinot noir? It's not a grape that grows in quantity around here, but there is some. They're telling us that the weekend is going to be yucky. On-and-off rain, possibly mixed with snow, and low temperatures around freezing. I suppose we should get used to it, eh? At least for the next four months. While yesterday's little freeze wasn't enough to put ice on the pond out back, most of the little puddles in the vineyard road froze over. 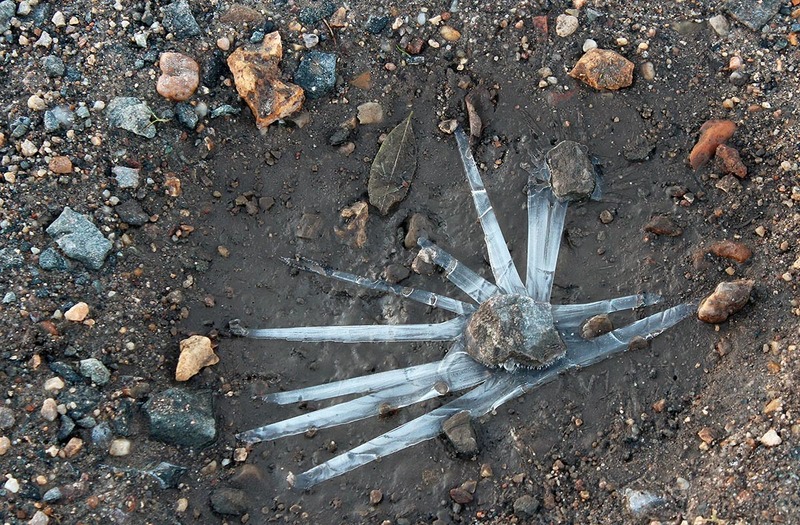 This one froze in a very interesting pattern, like a star or a rising sun. We saw frost in most places until the sunlight melted it. The day was brilliant, but the wind kicked up before long and we never got much above 5ºC. I could have cut some logs but I found other things to do, one of which was sharpening the blade on the axe I use for splitting the cut firewood. Winter approaches. This morning's low temperature is flirting with zero, the freezing point. The loft windows are iced over. From the downstairs windows I can see the waning moon and Orion's stars hanging low in the western sky. Some trees are already bare, others still hold their leaves tight. But their grip is loosening. 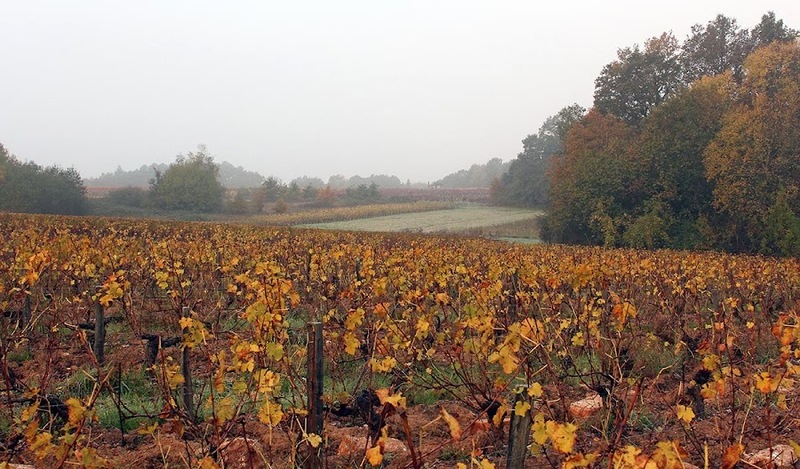 It's too soon for snow, at least here where we live, but snow is falling in the Rhône Valley this morning. Our day will warm up a little, according to the forecast, and rain is predicted overnight. Thankfully, because I'm not ready to deal with snow yet. Still, this morning's walk with Callie will be brisk! Fall continues. The wild weather we saw in the month's first half has moved on and now we're in the more familiar calm, cold, and fog. Leaves are dropping everywhere, but there is still color to be seen. This small parcel of vines is bright red. I wonder which varietal it is? Red vines on a chilly, foggy morning. I'm sure you're all wondering, so I'll keep you in suspense no longer. The chainsaw is back to it's old self again. It started up beautifully on Monday morning and I got another thirty logs cut without a sputter. I'm very near the end of cutting for the season; one or two more sessions ought to finish it. The walnut tree is one of two that I know in our neighborhood. This one stands alone in the vineyard out behind the house, very close to a thicket of acacia that lines the banks of a small stream making its way down into the river valley. In years past I've picked up fallen walnuts from beneath the tree. I've noticed a neighbor of ours doing the same thing. 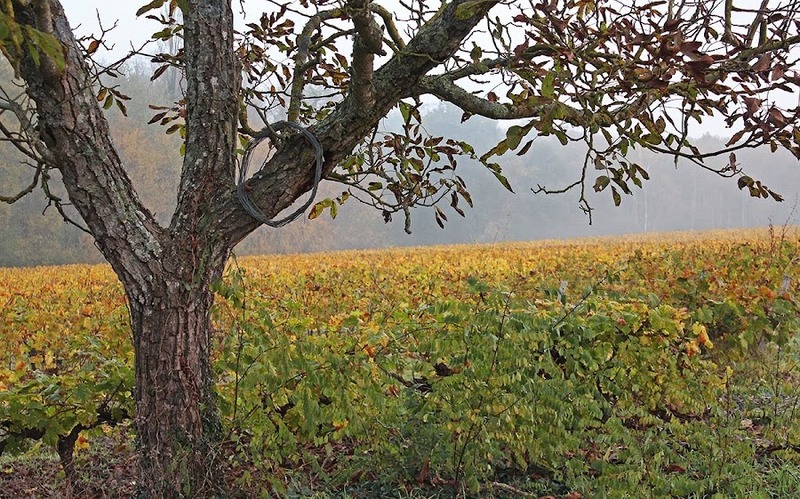 The local walnut tree is a good place to stash a grape-grower's guide wire. The nuts are small and there aren't many, and in some years there aren't any at all. Callie will find one or two on the ground when we walk by and stop to crack them open and eat the nut meats. She's good at that. So good that, whenever I crack walnuts for a recipe, she'll sit up close to me and beg for one. Later, I'll find a little pile of cracked shells on the carpet without a trace of the tasty nut to be seen. Since we've lived here, we've noticed that the typical weather in November is cold (not quite freezing) with thick fog. High pressure builds in and we get clear skies at night. That chills things down a lot. But as the sun rises, fog forms, and the high pressure keeps it from rising and dissipating. So we get low fog, gray skies, and cold temperatures during the day. 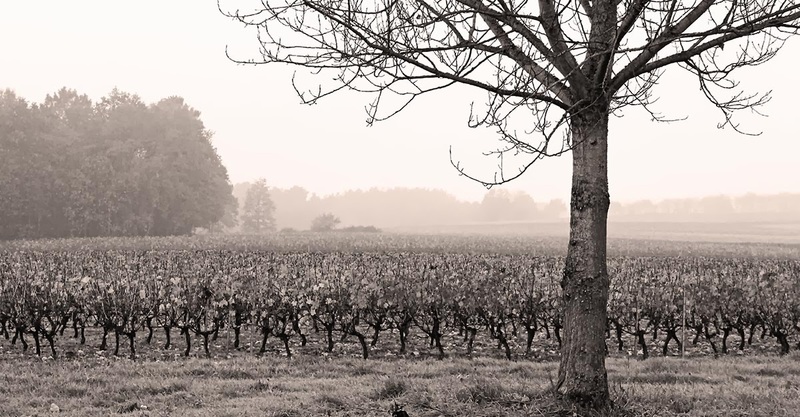 The fog is just starting to burn off, but it makes for a nice view across the vineyards. We're getting a taste of that now. Even so, on Saturday the fog actually burned off a bit at mid-morning giving us a nice sunny mid-day until the low clouds came back in the afternoon. I was happy to have taken the camera out to capture some of the foggy views. Fall is beginning its transition into winter. I think that our spell of mild temperatures is over. This morning we're down to 2ºC (about 35ºF) and there seems to be ice on our roof windows. The forecast for the next few days shows only single digits, from freezing (zero) up to around 7º or 8º highs (mid 40s F), with high pressure keeping us under a fog layer. Standard November weather. Sights like this are fewer and farther between as the air chills down. The daily wood fire is now routine. I clean the ashes out of the wood stove in the morning, then go outside for kindling and some logs. I usually split a few logs with the axe while I'm at it for better burning. I make the fire just after lunch (or earlier if the house has cooled down too much) and keep it going until the evening. We warm the house up in the morning with the oil-fired central heating system. I added the heavy wool blanket to the bed yesterday. Last night I was toasty warm and slept very well. With our nice crop of winter squash this year have come the seeds. I always like the idea of roasted pumpkin/squash seeds, but I"m often disappointed with the result. While I know that the white outer husks of the seeds are edible, they are often too tough and chewy. And if there's a practical way to get the white husks off the green interior seeds, I have not found it. Dried seeds from three squash varieties. I've put some away for planting next year. Still, I keep saving the seeds and trying every year. I made a batch last week with spaghetti squash seeds that I had let dry out for a week or so. I coated them with olive oil and a little curry powder and then toasted them in the oven. And guess what? The husks came out crisp, crunchy and tasty good. So I'm wondering: is it the squash variety or the fact that I let them dry instead of roasting them fresh out of the squash? As you can see, I have a few more batches to test out. If you have any pointers, I'd be interested! 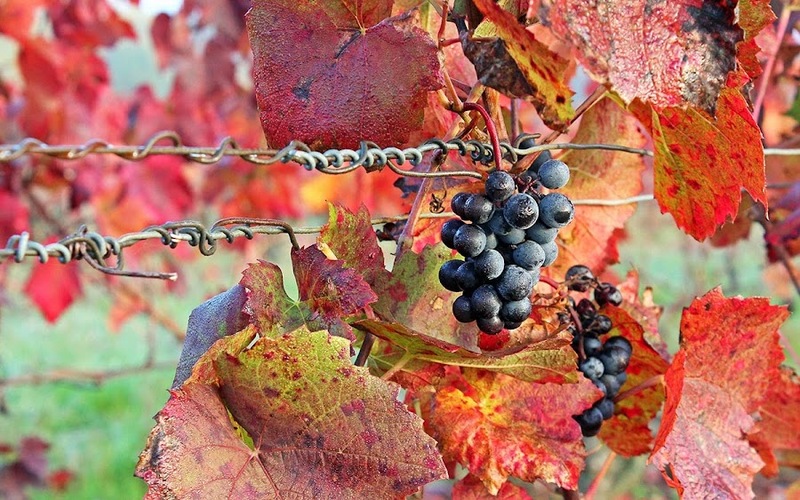 These grapes don't get harvested because they grow on vines that have been abandoned. I assume they will get eaten by wildlife or will eventually rot into the soil. I taste them from time to time in the fall and they're not bad. The tended grapes taste better because those vines have been pruned to produce better fruit. "Wild" grapes on the vine. They're not really wild, just abandoned. This morning we're down to about three degrees which is just above freezing. Heating season is definitely under way. I would still like to cut the grass one more time, but it's been so wet that I haven't been able to. The leaves are still falling, so there's raking to do. And I still have some logs to cut. That's the English name. In French, it's called fusain d'Europe. 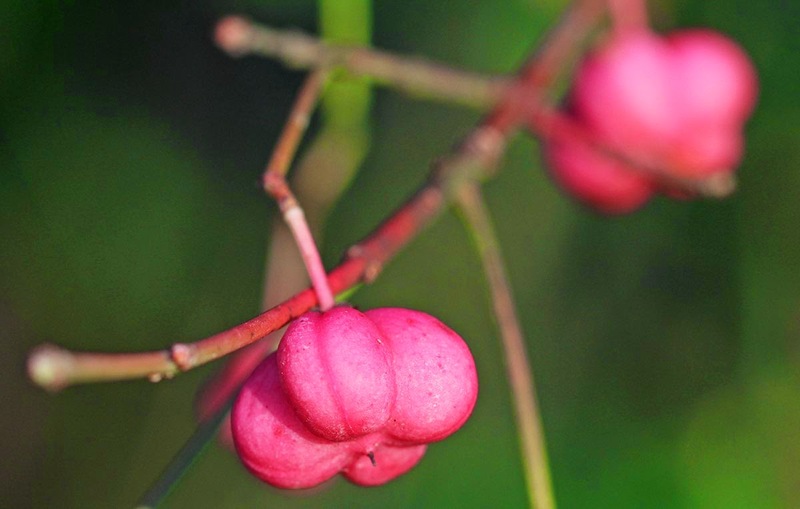 In fall, the berries turn a bright red/pink color and are hard to miss. Then, in early winter, they open up to release their seeds and show a brilliant orange interior. Very pretty. Fusain on the edges of the woods. The chainsaw is home. It ran beautifully at the mechanic's on Tuesday morning. He gave me some pointers on the fuel mixture, one being that I shouldn't use old water bottles to store the fuel because gasoline causes the plastic to degrade which then gums up the carburetor. He also changed the fuel filter. I noticed during my walk through the vineyards on Monday afternoon that the vine leaves are passing through their brilliant gold phase. Recent wind and rain have beaten them and many have fallen to the ground. But there is still a good deal of color out there. Here's a picture from out the window on Monday. It won't be long until it's all brown. A telephoto shot from the house looking west over the vineyards. I'm planning on going into the shop to get the chainsaw this morning. The mechanic cleaned out the carburetor and says it working fine. He suspects my oil/gas mixture is too rich in oil, so I'm taking some in for him to look at. I verified that I'm using the proper oil (special for two stroke engines) so that's not the problem. I may have mixed too much in. Our neighborhood undergrounding project continues. Last week we had the transformer debacle, when the new ground-level transformer blew because it was too small. That got replaced with a larger model rather quickly and we are now up and running on the new buried power line. September 2013: The old transformer at the top of the pole (center of photo). The pole on the left is staying put. Then, the workers took away the old pole-mounted transformer and cut the line between it and our houses. Pretty soon after that, the old aerial wires were cut and pulled down. All that remains now are the glass insulators at the top of the poles and the poles themselves. November 2013: Transformer is gone as is wire connecting to pole on left. Since I took this picture, the wires that go off to the right (barely visible here) are gone. I will be very interested to watch the workers take the poles down. They're made of concrete, not wood or steel. I'd love to ask the guys for a couple of those glass insulators. One of my grandfathers worked for the telephone company in upstate New York back in the fifties and sixties and he always had those blue glass insulators around his house when I was a kid. Having one would remind me of those days. Notice how the vineyards have gone from green in the top photo to golden yellow in the bottom photo. You can also see how brown the grass in our yard was in the summer (top) compared to how green it is now (bottom). I don't really like this photo. I messed with it a lot, but I'm still not satisfied. Still, here it is. One of the last of the fall roses in a neighbor's garden. I'm sure there will be other roses; we see them as late as December. It depends on the weather. 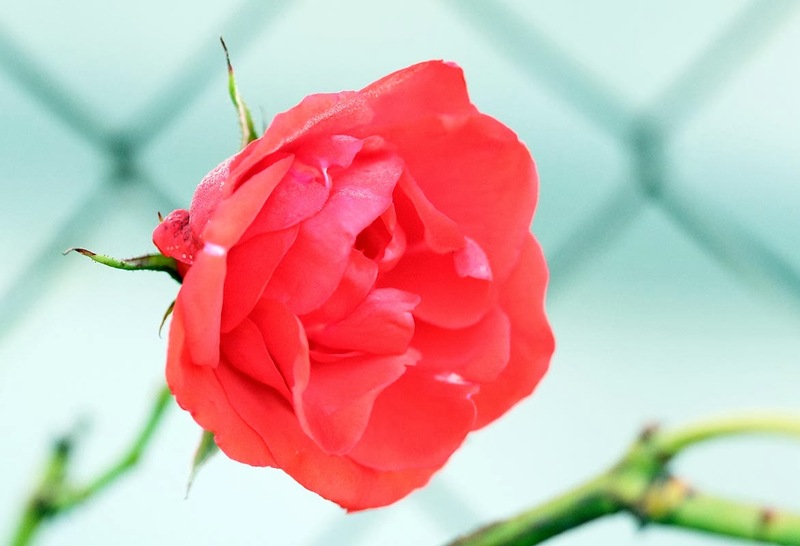 The background's a bit washed out, and the flower was a bit too saturated. This is the best I could do. Saturday morning was nice, but we got a rainstorm in the afternoon. I built a fire in the wood stove to keep the chill off, even though it's not all that cold. When the wind blows, however, it feels colder. The chainsaw is fixed. The mechanic thinks my gas/oil mixture has too much oil in it. I'm taking a sample of my fuel in for him to look at. It's possible... I may have screwed up the mixture. I'll keep you posted. The grape growers around us use "hazard tape" in the spring in an attempt to keep the deer out of their parcels. 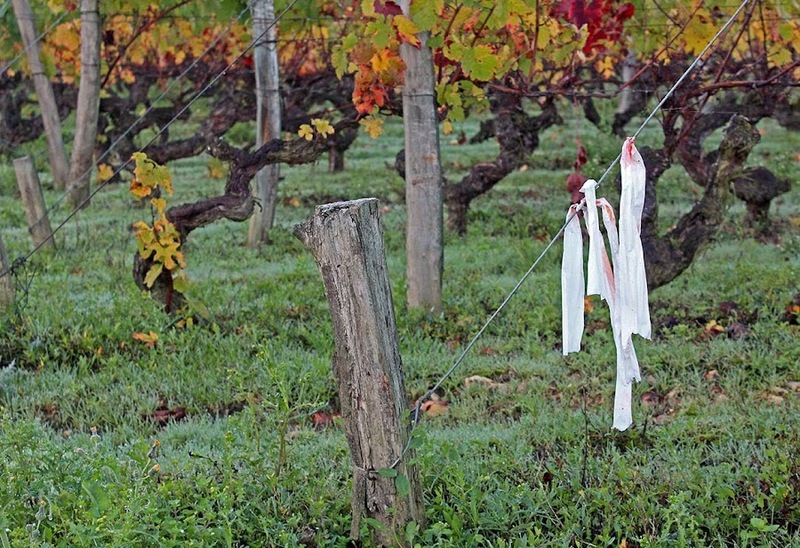 I'm not sure how well it works, but I know that the red and white bands of tape wrapped around the vineyard parcels detract from the visual charm of the vineyard. But then, the vineyards are not there for my viewing pleasure. A bunch of flags tied to the support wire at the end of a row of grape vines. The growers also use shorter bits, or "flags," of tape to mark certain parcels by tying strips to the wire at the end of a row. I don't know the code, but sometimes I think the little flags mark where one varietal ends and another begins to help with the harvest. The flags come and go, depending on the time of year and what's going on out there. I know I've done this before, but this time it's an oak leaf, so it's different. N'est-ce pas ? The rain systems are still churning through, but we had a small break on Thursday. I was able to get out and get the remaining apples up off the ground. There only a few left on the trees, so the major apple clearing is done again for another year. 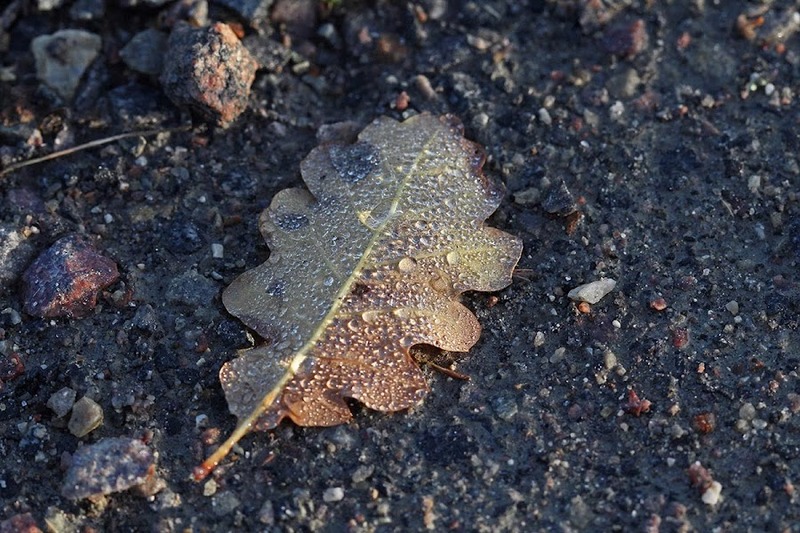 Dew drops on an oak leaf. 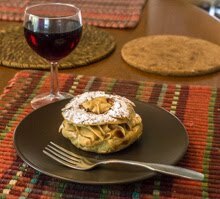 I saved some of the better looking apples and made some applesauce and an apple tart. The rest of the apples went into the compost pile. One of these days we'll have to look into getting a cider press. I'll have to do some research and figure out how that works and what we'd do with the juice, besides drink it. We ate some of this week's applesauce with boudin noir (blood pudding). I also used some of it in the apple tart. A few weeks ago I made a bunch of applesauce for the freezer. It will be good for applesauce cakes and other uses through the winter. The vineyards out behind our house are in their golden phase. When I look out from the western windows I see a blanket of gold. This won't last long; the leaves will quickly turn brown and fall to the ground. 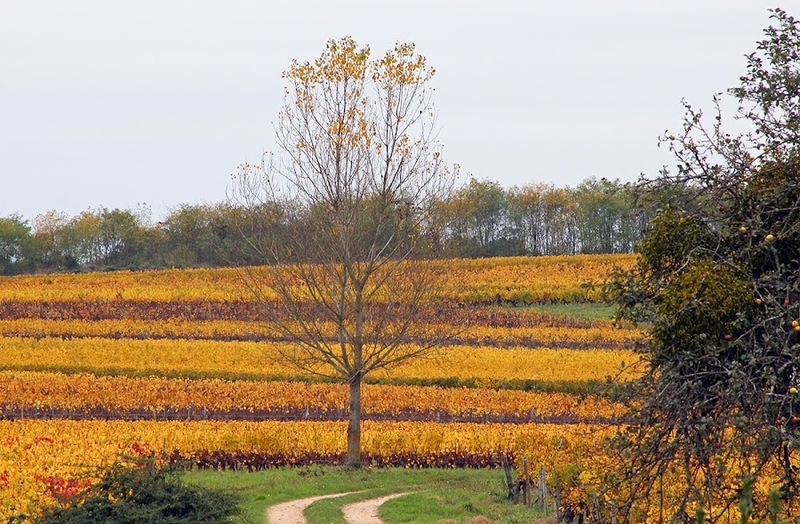 A rectangular patch of meadow among the rows of golden grape vines. Our power has now been switched over to the new underground lines. It didn't happen without a glitch, though. During the changeover, it seems, our neighborhood's new ground-level transformer blew. I talked to one of the guys about it and he said that they had un petit problème de tension. In other words, I think, they had installed the wrong transformer. Our power went out for about three hours on Wednesday morning while they replaced the transformer and re-established the link. After the power was restored, they took away both the inadequate transformer and the old transformer from up on its pole. They also removed the wires that linked our neighborhood to the old aerial power lines. I can already tell that the view from our western windows will be much improved once the rest of the lines and the poles come down. What can I say? It's that time of year. Around here, the most colorful leaves are found in the vineyards. The grapevines turn brilliant yellows, golds, and reds. The trees, for their part, are mostly yellow in the fall. 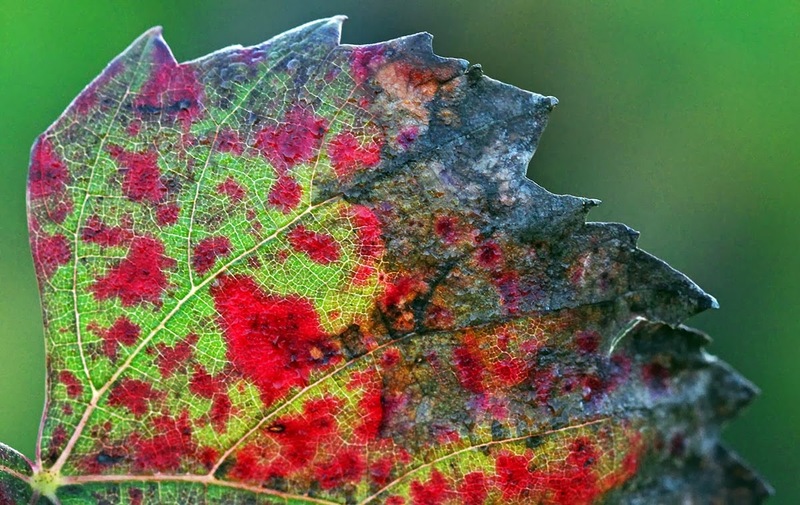 I love how the veins in this leaf make little compartments of color. We keep seeing lots of activity around the power line project going on in our neighborhood. The actual burying of the wires is long finished, but we're seeing work going on up on the poles and near the new ground-level transformers. I think they're getting ready to transfer power to the new lines. Just this week we've seen big generators installed around our neighborhood. They must have something to do with the changeover. The edges of the vineyards are home to many a wild rose. 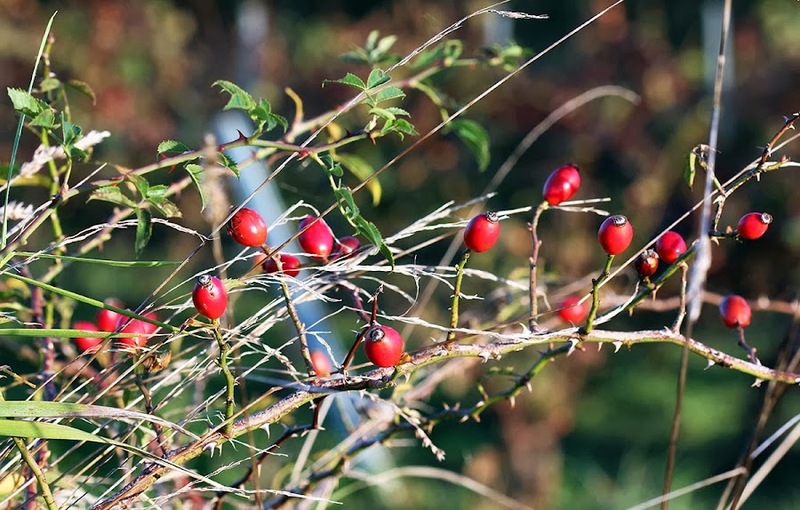 This time of year, their blooms gone, the rose's hips provide some brilliant color as a counterpoint to the yellows, golds, and browns of the vines. There are still a few green leaves on this wild rose. So far, our November weather is not at all November-like. It's mild, but we're having a series of windy rain squalls. Normally, November days are cold and still with heavy fog on the ground, like a graveyard on Halloween. I like the sun we're getting, and the blustery rain is a bit exciting. But it feels more like March than November. So far. 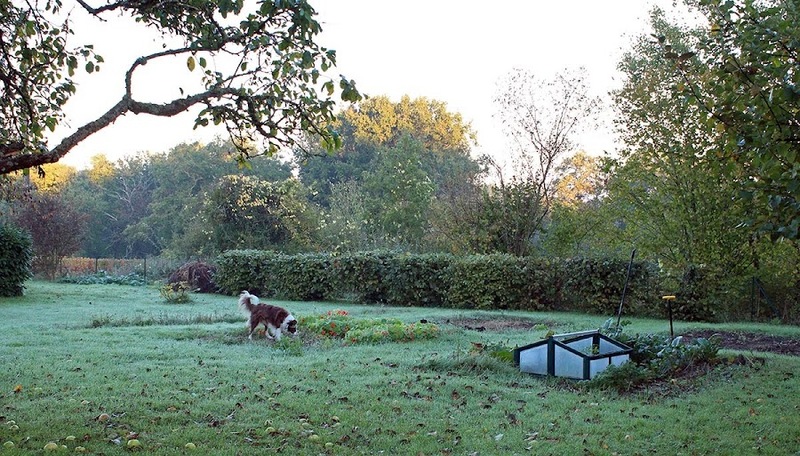 Here's Callie sniffing around in the vegetable garden just before our morning walk. The sun had just come up and it was a little chilly. You can see that most of the vegetable plants are gone, except for the kale and collard greens. And the nasturtiums. Inside the cold frame are a few jalapeno peppers, but they didn't produce much as a fall crop; it was an experiment. I'll plant some more in the spring. 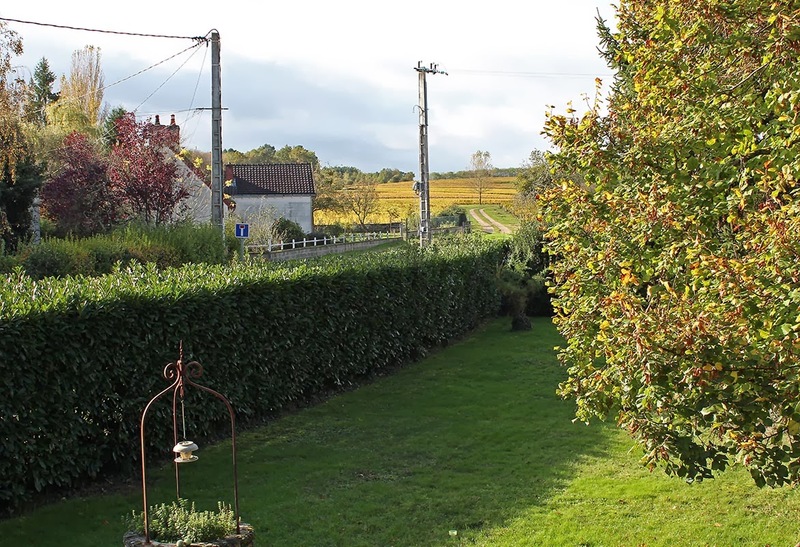 The hedge in the center is part of our hazelnut row. It was cut down to size last spring. I like it much better this way. Sunday was a lovely sunny day. There was a bit of wind, but nothing violent. Monday morning is rainy. And I have to go out again with Callie. In French, the word raisin means grape. What we Americans call raisins are raisins secs (dry grapes) in French. So these are both raisins and raisins secs. What the harvesters miss dries up on the vine. 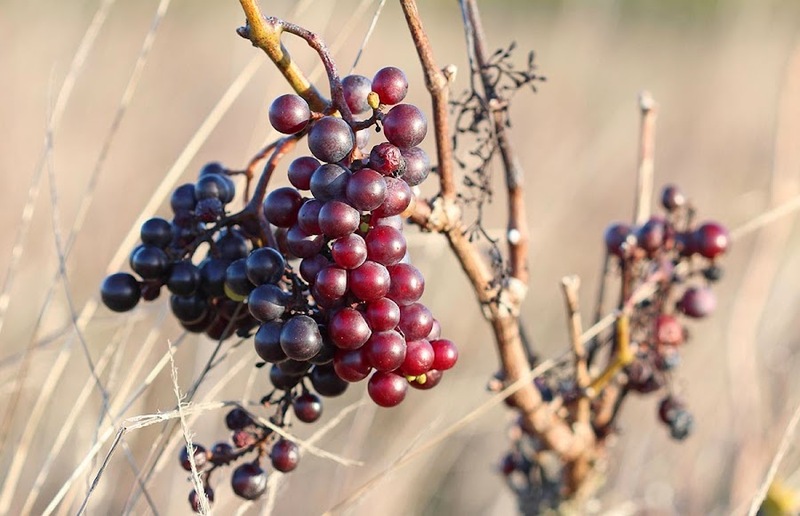 These grapes still have some of their color, but soon they'll be black and even more withered. 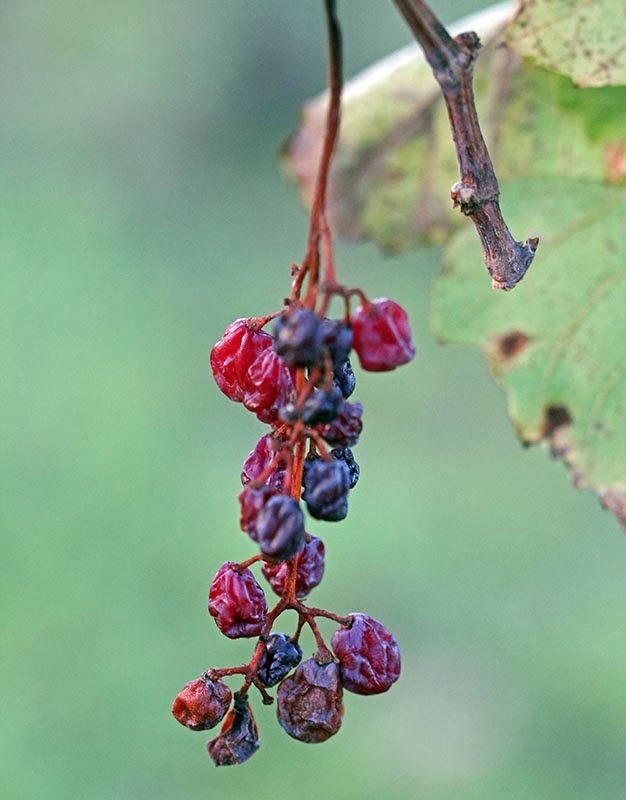 Red grapes becoming raisins on the vine. A series of weather fronts is moving through our region this weekend and into next week. We have alternating wind, rain, and periods of sun. It puts a damper on doing much of anything outdoors. 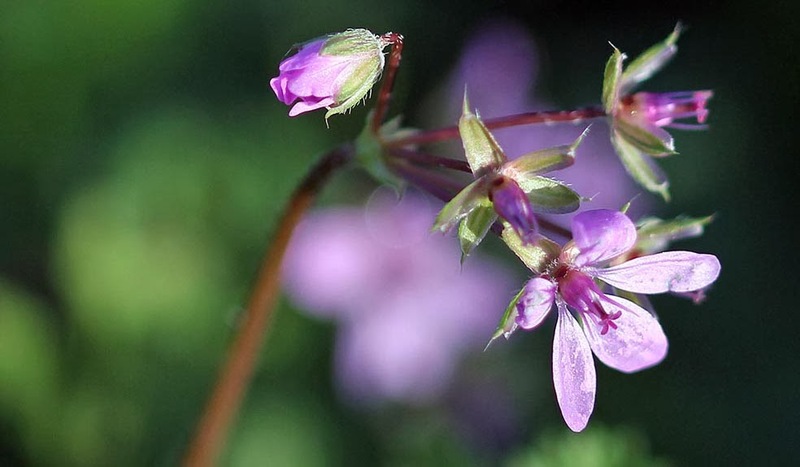 There are still plenty of wildflowers blooming in the vineyards. I don't know what this one is called, but it's everywhere right now. There are also a few daisies, and some other flowers here and there. Otherwise, fall is grinding in. 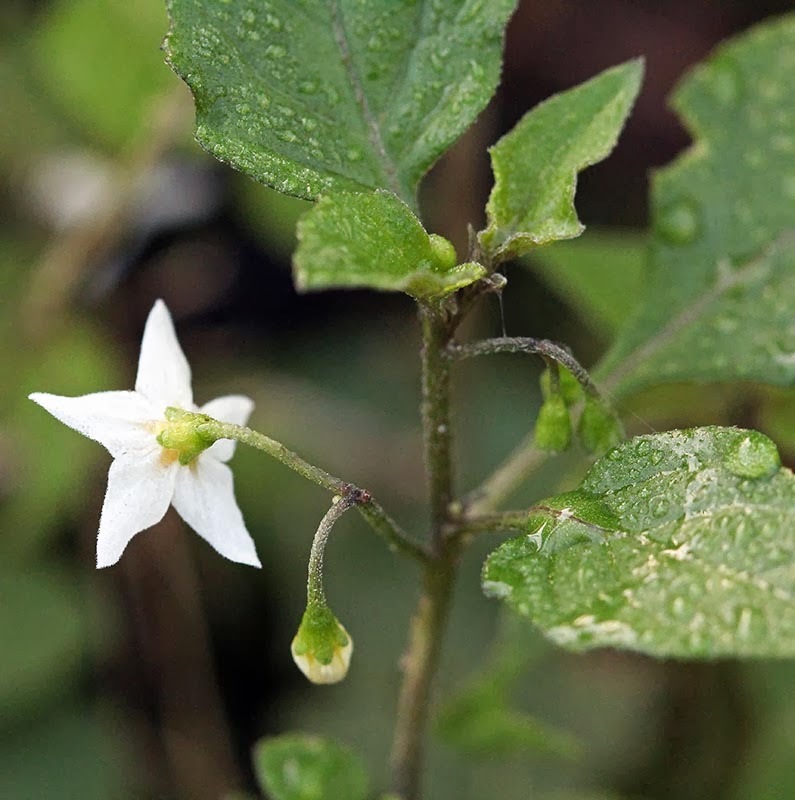 A tiny white flower that blooms in the fall. I'm amazed that it's November already. The months seem to be going by very quickly right now. I hope that lasts through winter and that it slows down for spring and summer. Lots of luck, right? At any rate, I'm already looking forward to spring and planting the next vegetable garden. 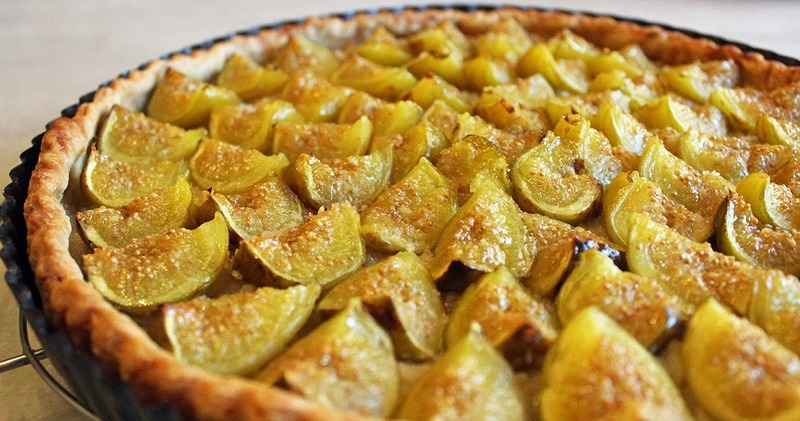 You make a fig tart! Or, at least, I do. We were fortunate to get a bag-full of green figs from a local friend who had a small surplus. The fruit was quite ripe and needed to be used right away. So I threw together a pâte brisée (short crust) and made a tarte aux figues (fig tart). The finished fig tart, ready to be tasted. It's a very simple pie. The crust is made with butter, but is not sweet. Under the figs is a layer of ground almonds and some sugar. I sprinkled a little sugar on the quartered fruit, then glazed it when the tarte was nearly done baking using some of Ken's home-made apple jelly. Delicious!